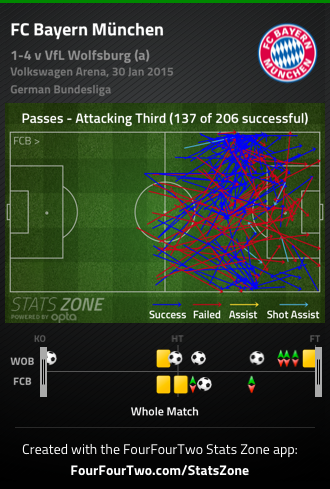 Combination Play: Wolfsburg 4-1 Bayern Munich: Wake-up call for Guardiola? 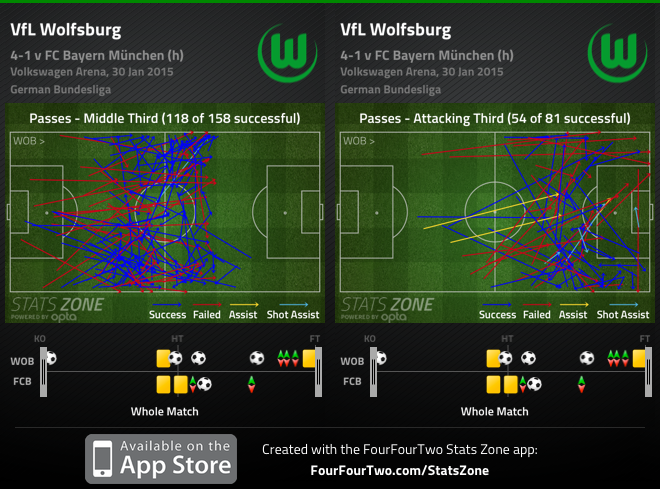 Wolfsburg 4-1 Bayern Munich: Wake-up call for Guardiola? In what proved to be one of the season's shockers, Wolfsburg trounced current (and most likely 2015's eventual) German champions Bayen Munich 4-1 in the Bundesliga's return to action after the winter break. Given that, more than the unbalanced result, Wolfsburg put in such an impressive display against one of Europe's toughest sides and that the Champions League will soon be upon us, there are some notes to take from this contest. One of the most interesting aspects of last night's match was how much Pep Guardiola's centre-backs (in this case, Dante and Jerome Boateng) were willing to hit long diagonal balls up front from the same part of the pitch. This looked like a very deliberate strategy, with Robert Lewandowski coming short to drag opponents out and one of the midfielders (Bastian Schweinsteiger or David Alaba, in the first half) trying to exploit the space behind the Polish striker. Given that Bayern lacked quick runs from behind from either Arjen Robben or Thomas Müller, for instance, Guardiola seems to have taken the competition-free weeks to work on a more varied approach, perhaps divining the succession of compact, deep-lying teams that side is about to face. 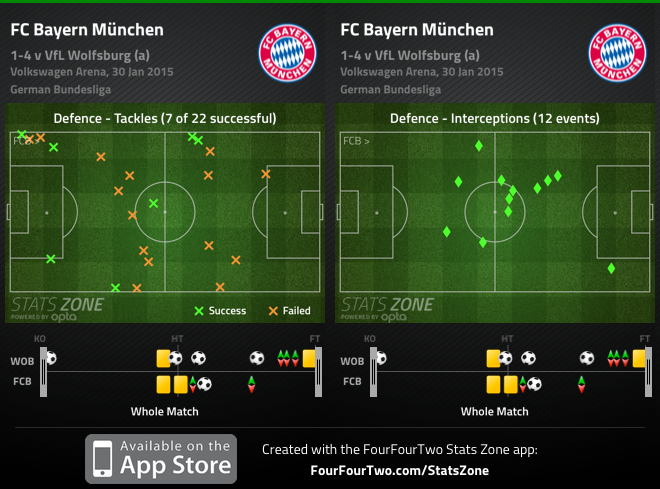 In fact, it was impossible not to notice how hard Bayern found to penetrate through their opponents' centre. Another interesting aspect of Wolfsburg's display was how they managed to rattle the usually metronomic Xabi Alonso, a key cog in the Bavarians' typically well oiled gear. Coach Dieter Hecking was smart in instruction one of Bas Dost or former Chelsea man Kevin De Bruyne to sit on Xabi Alonso to stop him from collecting and distributing passes easily. His chalkboard shows how the Spaniard struggled at finding his team-mates with positive passes, but the fact that he was caught in possession several times is even more revealing. There is one feature of Guardiola's teams that gets often overlooked, which is the transition into defence. The former Barcelona great tends to instill great urgency for the moment the ball is given away, frequently leading to the ball being won back very few seconds after it was lost. Here Bayern were not as proactive and their players were indeed often far from each other to assemble the usual net that stifles the opposition. That, coupled with the midfielders' reluctance (or unwillingness) to return, meant that Bayern defenders were often late and/or isolated in 1v1 situations, resulting in a small number of interceptions and a appalling tackle ratio. Dante and Boateng, in particular, had a torrid time last night and did not offer much in terms of stemming Wolsfburg's threat, which must be a worrying sign for Guardiola as the Champions League looms large on the horizon. Dieter Hecking showed that he was well aware of Bayern's vulnerabilities (even if last night's result should be taken with a pinch of salt). Wolfsburg were happy to cede possession to the German champions and hold tight at the back, but they seemed to know exactly how and where to hurt Bayern. On one hand, Hecking's men were smart enough not to try to break Bayern down through the centre when they got the ball back, rather immediately attempting to stretch their opponents out wide and searching for the pockets of space either side of Xabi Alonso (and, most importantly, behind Schweinsteiger and Alaba). Only then, after receiving the ball out wide and progressing towards Bayern's centre-backs, did De Bruyne & co. try to penetrate down the middle, much to Dante and Boateng's chagrin. De Bruyne, in particular, was tremendous by making himself available to constantly be the man on the run, whether it was in the centre or down the wings. his two goals perhaps showing just what an asset he could have been in José Mourinho's side. Catching Boateng and Dante high up the pitch, the Belgian made the most of his breaks and proved just how vulnerable tiki-taka-playing Bayern could be.